The photographs below are of a Victorian Tiled Hallway I recently restored in Stafford. This lovely floor was discovered underneath laminate flooring I can only assume because a previous owner of the house couldn’t work out how to restore it as it was in a terrible state and decided to cover it up. 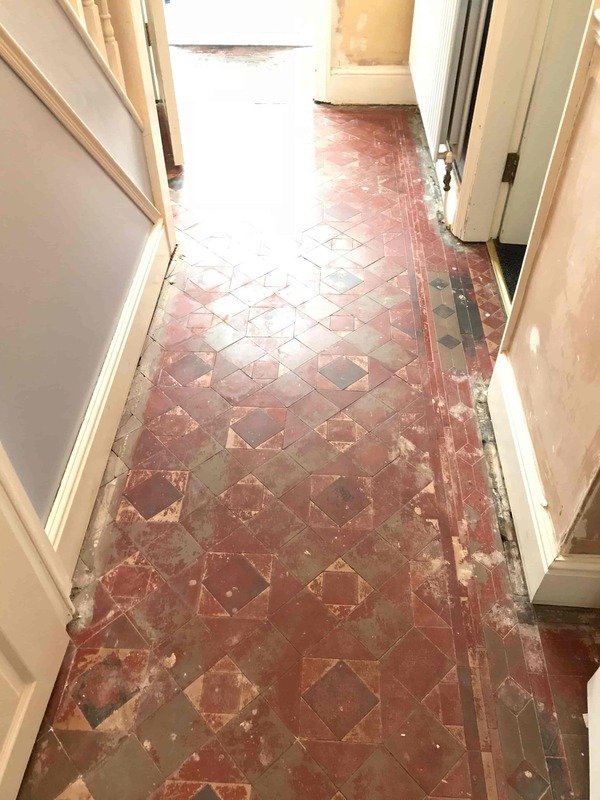 Fortunately thanks to the power of the internet the current owner discovered Tile Doctor on-line and called us in to have a look with the aim of restoring the floor as a period feature. Laminate is laid as a floating floor so unlike vinyl or carpet coverings that I usually deal with the laminate had if anything protected what was essential a very dirty Victorian tiled floor that was stained with adhesive and paint splashes. With the laminate flooring already removed by the owner my preparation consisted of adding protection to the wooden paintwork. Once done I started to tackle the dirt by applying a strong dilution of Tile Doctor Pro-Clean and leaving it to soak into the tile and grout for about fifteen minutes. Then with a rotary machine fitted with a black scrubbing pad and running at slow speed I set about scrubbing the floor to get as much ingrained dirt out of pores of the Victorian floor tiles as possible. Once that was done I rinsed off the now soiled cleaning solution with water and then extracted it with a wet vacuum. This action made a huge difference to the tile and grout, but the paint and adhesive stains were more difficult to remove so these areas were treated with Tile Doctor Remove and Go assisted with a steamer to help draw the staining out. With the tile ad grout now clean of dirt and stains I gave the floor a rinse with water to remove any trace of cleaning products and then extracted as much moisture from as possible using the wet vacuum. I then left for the day allowing the floor to dry off fully overnight. The next day I confirmed the floor had dried off and then proceeded to apply five coats of Tile Doctor Seal & Go Extra which is a fully breathable sealer that adds a lovely shine to the tiles. I used a fully breathable sealer as these old houses were built before the invention of the damp proof course and I wanted to ensure that any moisture could rise through the floor and evaporate unhindered. The final photograph shows the huge transformation I achieved with the floor and as you can imagine my customer was very happy with the result. 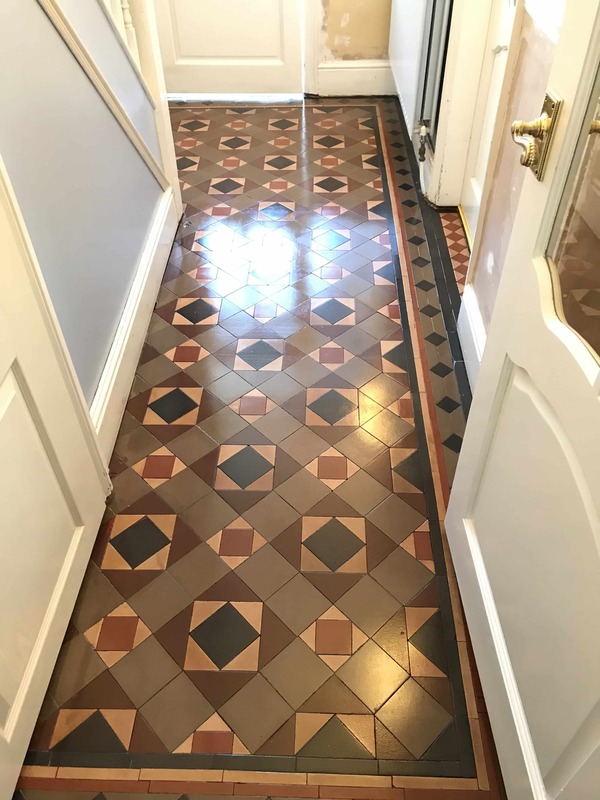 This entry was posted in Victorian Posts and tagged grout cleaning, Laminate Flooring, removing glue, Removing Paint, stafford, staffordshire, tile restoration, victorian tile cleaning, victorian tiled hallway by AbzDominise. Bookmark the permalink.